Now in its 15th Season, YAGP has awarded over $2 million in scholarships to the leading dance schools worldwide. Over 25,000 dancers worldwide have participated in YAGP’s international workshops, competitions, and audition classes. Over 300 YAGP alumni are now dancing with 50 companies around the world, including American Ballet Theatre, New York City Ballet, Paris Opera Ballet and San Francisco Ballet, among others. YAGP’s contributions to international dance education were recognized by the United Nations Educational, Scientific and Cultural Organization (UNESCO) with a membership in UNESCO’s prestigious Conseil International de la Danse (CID). Since inception, Youth America Grand Prix has become an internationally known meeting place for dance students and teachers, where they can exchange ideas, share their experience and learn the most up-to-date information on a variety of issues in ballet and contemporary dance. YAGP’s level of reputation as a showcase for dance students from America and abroad is such that even passing the preliminary round to be selected to participate in the New York City Finals gives a participant an important distinction and a boost to their professional dance career. Fashion innovator, pacesetter and legend B Michael began his career as a former account executive for a Wall Street firm, B. Michael decided to pursue his creative side, launching a successful millinery line after designing for Oscar de la Renta, Louis Feraud, and Nolan Miller for the hit TV series Dynasty. The designer, under the guidance of Eleanor Lambert, debuted his first couture collection in 1999, and has shown his collections to wide acclaim stateside, as well as in Asia. A favorite among some of the most photographed women in the world, B Michael’s designs have been worn by Cicely Tyson, Ashley Bouder, Beyonce, Cate Blanchett, and Tamara Tunie among others. B Michael is a dedicated philanthropist and supporter of organizations that educate and empower young people, thereby shaping the leaders of tomorrow. B Michael was recognized for his philanthropic efforts on April 8th 2013 by the non-profit educational organization Figure Skating in Harlem. Ballet in Cleveland presents a premiere production with some of the finest dancers and choreographers in the world with The Ashley Bouder Project: An Exposé on Ballet Style. Ashley Bouder, Principal Dancer with The New York City Ballet, and Phil Chan, General Manager of Youth America Grand Prix, the world’s largest student ballet scholarship competition, have partnered with Ballet in Cleveland to present a performance of the highest caliber of professional ballet today. The first act features grand classical and neoclassical works by ballet legends Marius Petipa and George Balanchine. 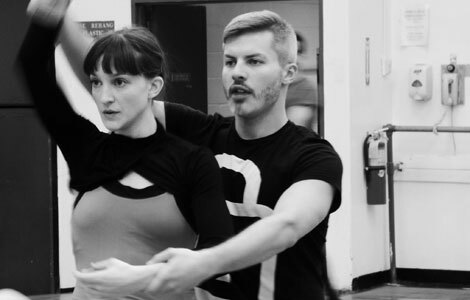 The second act boasts a world premiere to the music of Shostakovich, performed by soloists from the Cleveland Institute of Music, costumes by B Michael America, and choreography created for the project by Joshua Beamish, artistic director of MOVE: the company. Don’t miss this incredible performance which is a historic event for Cleveland. VIP tickets include a pre-show reception, prime seating, and a post-show reception with the dancers and choreographer. This performance is made possible in-part by a generous donation from Forest City Enterprises. Children under two years old are generally not permitted in the theaters. At designated performances Children of all ages are permitted. However, everyone regardless of age must have a ticket. All children must be seated with an adult. Any person disrupting a performance or inhibiting the enjoyment of an event for guests may be removed from the theater without refund.